Your company’s branding expresses who you are, what’s important to you, and what you can do that other companies can’t. There’s no better place for you to show customers who you are than online. But having an online presence that does your business justice doesn’t just happen — it takes some serious planning and hard work. 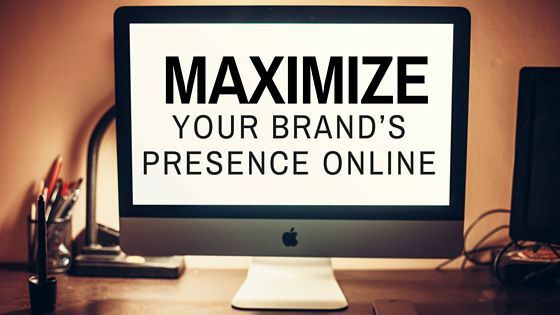 Here are five ways you can maximize your presence online and make some loyal customers in the process. Your website should be your company’s home base. It’s where people go to learn about you and it’s the best place for you to tell your story. Unlike on social media where what people say can impact your image, you have complete control of your messaging on your website. If you want to know details about what makes a brand-maximizing website, check out our Website Checklist Video. Social media gives customers the opportunity to interact with you online. Use your profiles to talk to your followers, but more importantly, listen to what they have to say. The more engagement you see on social media, the bigger your following can become. A devoted following means more customers for your business and a bigger chance for you to show people what you’re all about. An important part of building your presence is keeping your look and what you say consistent everywhere online. Whether it’s your website, social media profiles, or online ads, people should be able to easily recognize your company and your voice. Make sure your logo, images, colors, and messaging all align with how you want people to see you online. Showing off your company’s personality and culture makes your online presence unlike anyone else’s. People want to support a company that stands out from the rest and has a culture they can get behind. Your personality should be reflected in the way you communicate with people, your posts on social media, and the content you share. Sharing information that your followers and potential customers value is essential to proving that you’re worth their attention. Share content on your social media and company blog that people will benefit from. This not only can increase your reach online but can help establish your credibility as an expert in your industry. Creating exceptional websites and tools that help small business owners maximize their online presence is what we do — and we’re the best at it. Call us at 844.207.9038 or email hello@mopro.com to learn how we can help your business succeed online.